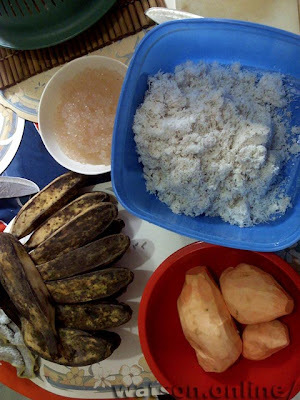 Guinataan always invokes happy childhood memories. 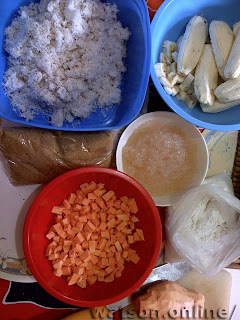 The ingredients are quite simple and can be readily bought from the stalls in the market where coconut is grate fresh. When we're looking for something to do on weekend afternoons, our eldest sister would take a visit to the nearby market, and soon we'd be busy making white balls out of the galapong. 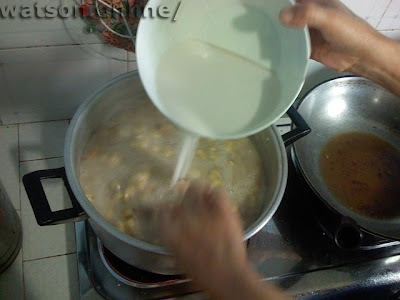 Ah, the smell of the guinataan as the coconut milk is poured into the pot! It's comfort food for me. These days, I rarely get my share of homemade guinataan, save for the nearby food store in the office. So one weekend, we decided to have one. This time, it's my mother-in-law (we call her Inay) who cooked for us as we helped prepare the ingredients. Place galapong in a bowl. Set aside a small portion. Pour water into the bowl and mix. Repeat procedure until you get the dough that will hold shape on its own. Dust a large plate (or bilao, if available) with galapong so the balls won't stick to the plate. 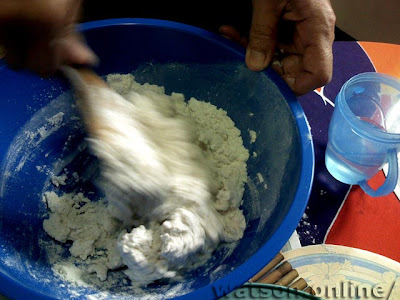 Take a small portion of the dough and roll into a ball the size of a small marble. Repeat till you exhaust the dough. You can watch TV or chat or listen to the radio while doing this if you like. Get a strainer and place the grated coconut milk here. Pour hot water onto the coconut milk; a bowl will catch the resulting coconut milk. When you have poured around 3 cups of hot water, squeeze the coconut milk to extract more of the milk. Set aside. Place water in a pan. Try to estimate the quantity; when all the ingredients are placed in the pan, the water should be just enough to submerge all these. Bring to a boil, then put in medium heat. Place the galapong balls into the water. 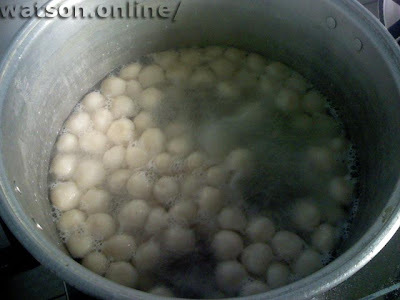 When all the balls are floating, these are already cooked. 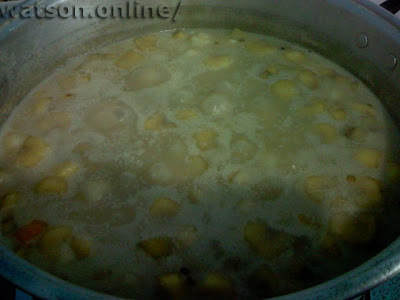 Add the diced saba and camote into the pan and cover. Check occasionally when these are cooked by piercing the camote with a fork. Next, pour in the coconut milk, mix, and continue cooking until the soup thickens. Thank you for the recipe. kahit wala ditong saba, i can make use of mexica plantain. Katrabaho naman nyang guinatan na yan. Mukhang sarap na sarap si Tina ah. 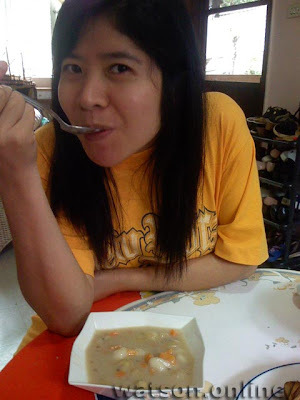 ann: Sa Baguio kasi, parang you still have lots of time to really take time out to prepare and cook, and the result is delicious! Kiwipinay: Naku, masarap talaga ang guinataan! At mainit pa! Tapos umuulan sa labas, e sa Baguio malamig kapag umulan talaga! Waaah miss ko na tuloy Baguio. Kiwipinay: yung galapong is rice flour nga... pero ang alam ko, malagkit yun dapat, not the regular rice. Uy pwede ka gumawa ulit ng palitaw with photos tapos i-post ko rin dito! Kiwipinay: naku... malamang na-Twitter na tayo ni Doc papunta sa post na ito. hahaha! Kung may ibang version ka ng guinataan, pahingi rin ng tip at nang mai-crosspost dito. I love langka in my guinataan!